Ever hear someone walk into a room and scream, “It smells like broke in here!” They were probably wearing AirPods. If you didn’t hear them, you were probably wearing AirPods too. The newest fad of 2019 is Apple’s $159 wireless AirPods. Before Christmas, mainly mediocre basketball players and rich kids who wanted other kids to know they were rich would wear them around. But after everyone opened their gifts, practically everyone would have them, from 7-year-olds to 40-year-old dads that want to seem young. Even worse were the people who would spend money on another case to surround the already existing case for the AirPods, inadvertently reducing their clout level by 14000. The wireless earbuds have also become one of the biggest memes of the year. Multiple YouTubers and Vine stars have made videos poking fun at AirPod users, such as claiming AirPod users are the richest people in the world, and then Jeff Bezos after them. Since their release in 2016, AirPods have become a “hype” item, similar to the hype surrounding Jordan’s but not on the same level. The price and demand are not justified by the quality or the features. AirPods are practically the same thing as Apple’s wired earbuds but with a couple extra features, including one touch pause, play and skip. Users have an array of controls at their fingertips with just a couple taps. But at the same time, people with regular earbuds have the same controls by simply taking half a second longer to open their phone. 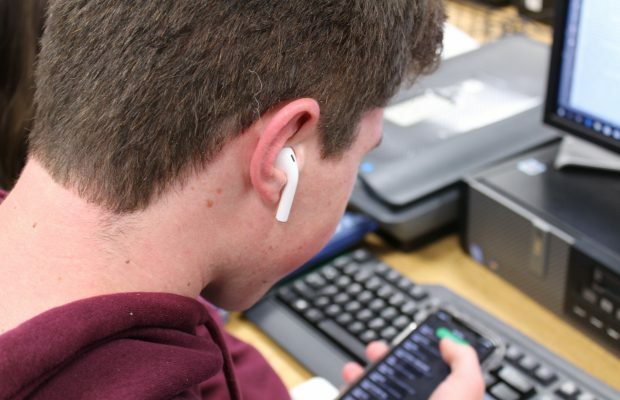 Nobody seems to realize that, or they just have a lot of money to waste because Apple sold 14 to 15 million pairs of AirPods last year, and is projected to reach 50 to 55 million this year. If every pair is bought at the price labeled on Apple’s website, that totals to about $8 billion that people are spending on AirPods. The sound quality is practically identical and even if it was better, most of the people using them wouldn’t be able to tell the difference. They’re a complete waste of money when wired earbuds are a perfectly viable alternative. If Bluetooth is that much of a desirable feature, then there are other wireless earbuds on the market at half the cost that are higher quality.